The “Wing” is Wing and Laurie – the couple who founded the SAHA. Wing and Laurie (they prefer first names only) walk the talk when it comes to helping the homeless in Sedona by raising donations and distributing food and temporary shelter items for the past three years -- at times while living out of their car with their two dogs. The “prayer” is the $10,000 in donations they have been hoping for to open their center. They have raised $3,000 since it was leased in January. They don’t want to call their new homeless office a shelter. The space is filled with couches and tables and it’s a place for homeless people to come in and socialize, Laurie said, but it’s much more than just that. 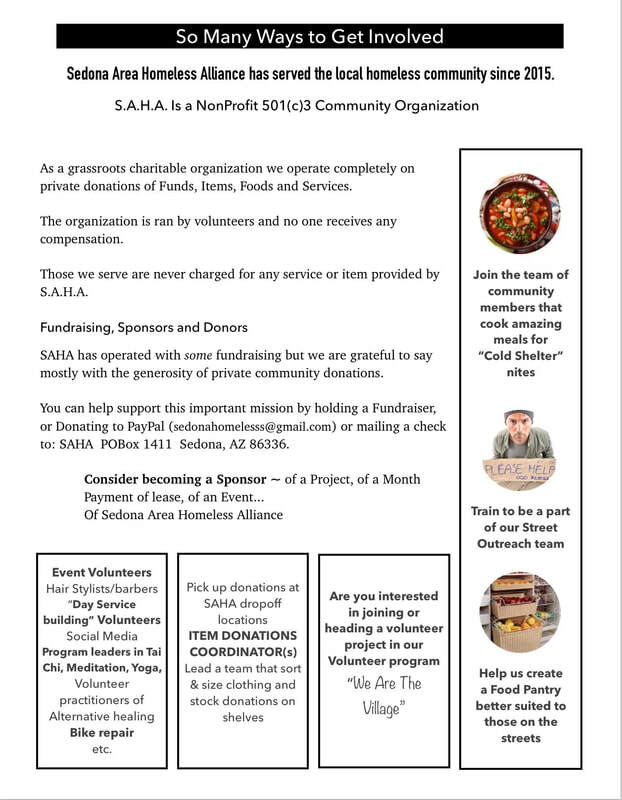 SAHA also raises and provides clothing, meals though a food-recovery program, tents, sleeping bags, blankets and all items for shelter, hygiene items, helps homeless sign up for disability and food stamps, apply for dental services and provides hair cut services and computers for research. “Everything we do is very purposeful,” Laurie said. “Building up a homeless person’s self-respect encourages them to seek jobs and housing on their own,” she said. Walking into their homeless center, it appears to be a spotlessly clean, second-hand store with several racks of coats and clothing. The difference is that all the coats and clothing are free, and Laurie stresses that people can take as much clothing or anything in the center that they need. Laurie said she has worked with about 15 homeless people since they opened, and all of them need help -- despite having employment in Sedona. “Most of our local homeless do work,” she said. Laurie said homeless live in tents and in cars and work in Sedona. A lot of times people don’t take showers, they go to the library or one of the local stores and wash up in the bathrooms. She said people don’t really join gyms just to take showers because of the cost. Some people go to the state parks, Laurie added. “People don’t like to be in those situations,” she said. Beyond the coat and clothing racks are several couches where homeless people can relax and get off the street. In the summer, that can mean 100-degree temperatures. Laurie said all the furniture has been donated. In the back of the office they have a food cupboard, with shelves of food geared to their population; quick to serve and eat. They said that volunteers bring in hot lunches in pots. The building’s hours are 8 a.m. to 5 p.m.
Laurie said the next week will be cold and wet and she expects to have people coming in out of the cold. The new center cannot offer overnight shelter, according to the agreement with the landlord, she said, but added that their space is not right for an overnight shelter. If they opened a cold-weather shelter, it would be in another location where they would have more space or go back to renting motel rooms in emergency cold-weather situations. “The more times people come in and they feel like they are at home, the more they remember what that feeling was, and the more that they desire it,” Laurie said. ​Originally published by the Verde Valley Independent on February 16, 2019. The Mission of the Sedona Area Homeless Alliance (SAHA) is to create projects, services, and programs that protect, advocate for and empower our local homeless community. SAHA's mission includes developing a network of members and supporters and is dedicated to ending homelessness in Sedona and the Verde Valley.